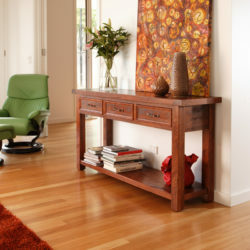 This timber entertainment unit is constructed of solid Cherry-wood. Customers can select from a wide range of handles and timber stains from our range or matched to a sample. 2 doors with bevelled glass. 4 drawers for CD / DVD storage. Centre chanel speaker panel.